A three-bedroom family house on a tight, infill site in Clapton. The house plays with scale, using oversized windows and openings to create a greater feeling of space across the rear courtyard. Rushmore Road is a three-bedroom family house on a tight infill site in Clapton. 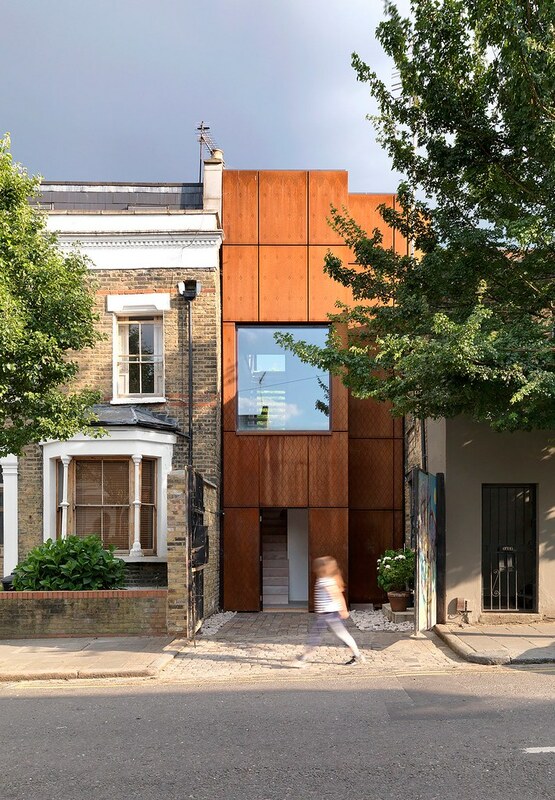 The corten steel clad house, which deals with 11 boundaries and has a street frontage of 3.5m, manages to successfully insert three stories of accommodation arranged around a rear courtyard. The house plays with scale; using oversized windows and openings to create a greater feeling of space across the courtyard, picking up precious longer views and providing a strong connection to the street. Entering through a small front yard, the hallway leads onto three ground floor bedrooms around the courtyard. Immediately in front of the entrance is a three-storey staircase with a concrete block wall to one side and netting in place of a guard rail to the other. Large windows at the top of the staircase and open treads mean the stair is flooded with natural light. On the first floor, where the family congregates, the client wished for as much height as possible; the trick is pulled off by connecting a series of distinct areas defined by changes in levels, scale and height. These allow for different spatial scenarios and occupation; through the dining area and kitchen up onto a higher living area. The spaces are tied together by douglas fir floor and kitchen - playing with scale and the illusion of volume. The second floor is an office for the client and leads onto an expansive roof deck; sitting between the roof tops of its neighbours. The perforated patterning of the facade is most intricate where people can get closest to it and becomes very much part of the internal spaces with its detail, transparency and beautifully changing shadows during the day. With the new London Plan calling for a Hackney target of 6600 new housing units on small sites, this type of sensitive and clever approach might well become exemplar for its use of an inner city single unit family home on an back land infill site.